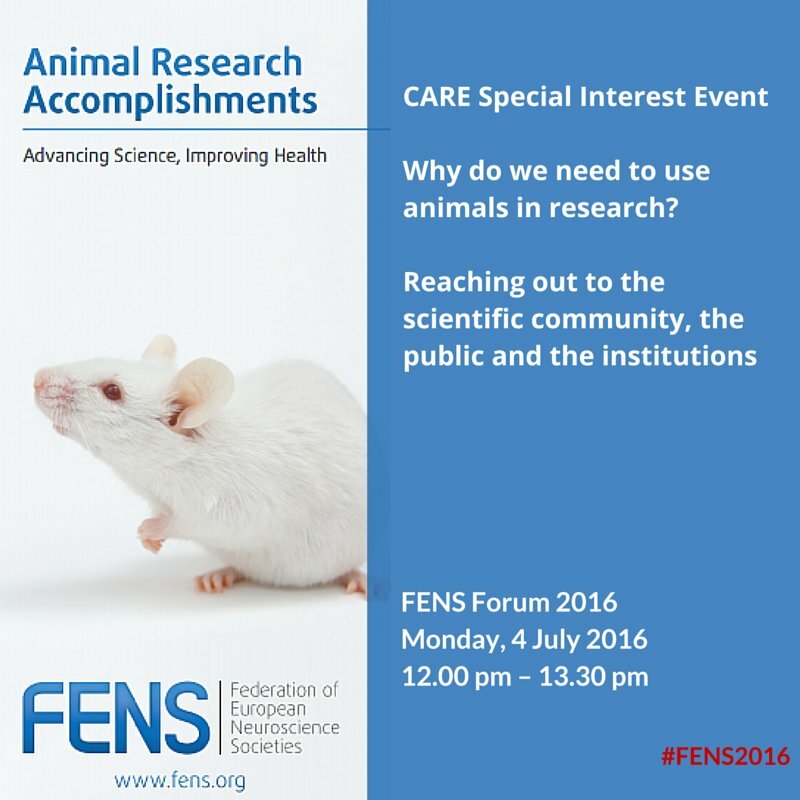 On July 4, 2016, at the 10th meeting of the Federation of European Neuroscience Societies (FENS), a Special Interest event took place focused on the critical need for communicating effectively to the public, to the scientific community, and to institutions about how and why researchers utilize animals in biomedical research. The lunchtime event was well-attended by conference attendees, who actively participated in engaging discussion and provided thoughtful questions throughout the session. First to present was Francois Lachapelle, Chair of the FENS Committee on Animals in Research (CARE), which advises FENS on the responsible use of animals in neuroscience research. Lachapelle described CARE’s activities and goals to the attendees, which include supporting members and partners in emergency situations (such as attacks from animal rights activists), publishing statements on issues regarding critical situations in animal research (including the continued need for primates), and to develop a culture of proactive communication about animal research. CARE accomplishes this last goal through various videos, media statements, and public lectures and events. Lachapelle highlighted CARE’s active involvement in drafting a statement to the European Parliament in response to the European Citizens’ Initiative (ECI) “Stop Vivisection” movement in 2015. This stimulating debate was a good segue way into the next speaker, Dario Padovan. Padovan is President of Pro-TEST Italia, a non-profit that “aims to promote and disseminate to the public correct knowledge on scientific research.” His presentation was less about communicating with the public about animal research and more about avoiding and preventing a crisis in the first place. After demonstrating the myriad ways in which scientists can and have been secretly video recorded by animal rights groups, Padovan continued with security tips to scientists such as restricting animal areas, having a no-cell-phone policy, having visitors wear hazmat suits (presumably to cover hidden camera lenses), and to beware creative editing by animal rights groups. Not only was this advice perceived by many to be in stark contrast to Lerma’s preceding presentation about openness in animal research, but also contrasted his presentation at the Society for Neuroscience’s 2015 meeting just 8 months prior when Padovan gave an inspiring presentation on how Pro-TEST Italia increased positive public perception of animal research in Italy. Padovan did end his talk with a few slides that held key guidelines for openness in animal research, which led nicely into the closing presentation, again by Lachapelle, who discussed general rules for talking with the public about animals in research. Of particular importance is the need for scientist to be proactive (rather than defensive) in their communications, to show their passion to the cause of science, and to emphasize the regulations in place that ensure animal welfare and ethical research. Speaking of Research promotes openness whilst also respecting the importance of a safe working environment. Each institution must develop individualized strategies to accomplish this intersection within their unique environments. A recent successful example was the first national Biomedical Research Awareness Day, which multiple universities participated in this past May. In all, the event by FENS served to energize scientists – particularly those in the “next generation” (i.e., trainees and young investigators) to be openly passionate and communicative about the important work they do to both save lives and to promote the study of science.